The canalith repositioning procedure can move the otoconia to a part of your ear where they won't cause dizziness. Performed in your doctor's office, the canalith repositioning procedure consists of several simple head maneuvers. The procedure is quite effective, relieving vertigo in approximately 80 percent of individuals after one or two treatments. However, the problem may recur. Vertigo usually results from a problem with the nerves and structures of the balance mechanism in your inner ear (vestibular labyrinth). BPPV occurs when particles called otoconia break loose and fall into the wrong part of the canals of your inner ear, producing an episode of vertigo. The goal of the canalith repositioning procedure is to move the otoconia from your inner ear to the utricle. 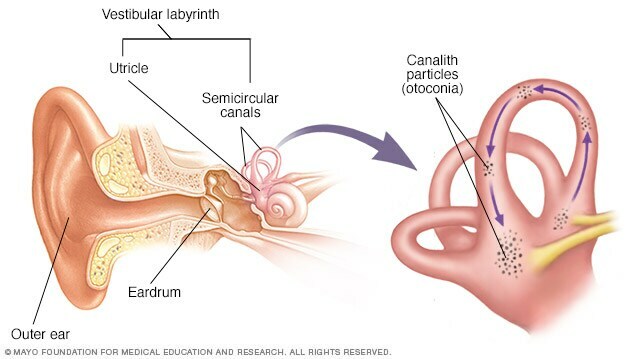 The canalith repositioning procedure is performed to move the symptom-causing otoconia from the fluid-filled semicircular canals of your inner ear into a tiny bag-like open area (vestibule) that houses one of the otolith organs (utricle) in your ear. Once there, these particles won't cause vertigo and will likely dissolve or be reabsorbed by bodily fluids in your ear. The canalith repositioning procedure can treat benign paroxysmal positional vertigo (BPPV), which causes dizziness when you move your head. The procedure consists of head maneuvers that move particles in your inner ear (otoconia) — which cause dizziness — to a part of your ear where they won't. The canalith repositioning procedure involves holding four positions for about 30 to 45 seconds each or as long as symptoms remain while you hold that position. Typically, you will remain in each position an extra 20 seconds after your symptoms have stopped. The procedure may be repeated three or more times within a treatment session. Depending on your health provider's preferences, you may wear an infrared imaging device over your eyes. This device helps your health provider examine your eyes during each maneuver. The device can help but it isn't necessary for successful treatment. The next morning, following your doctor's instructions, you may need to perform similar exercises — but without hanging your head over the edge of the bed — by yourself to check whether the procedure in the office was effective. If your vertigo continues, tell your doctor. You may need to perform these exercises for several days before your symptoms subside. Nearly 80 percent of people who undergo the procedure experience relief. If symptoms return, however, then a repeat of the canalith repositioning procedure can be used. It may be necessary to repeat the procedure several times to relieve your symptoms. Talk to your doctor if your symptoms don't improve. Hilton, MP et al. The Epley (canalith repositioning) manoeuvre for benign paroxysmal positional vertigo. Cochrane Database System Review. 2014;12:CD003162. Review. Gold, DR et al. 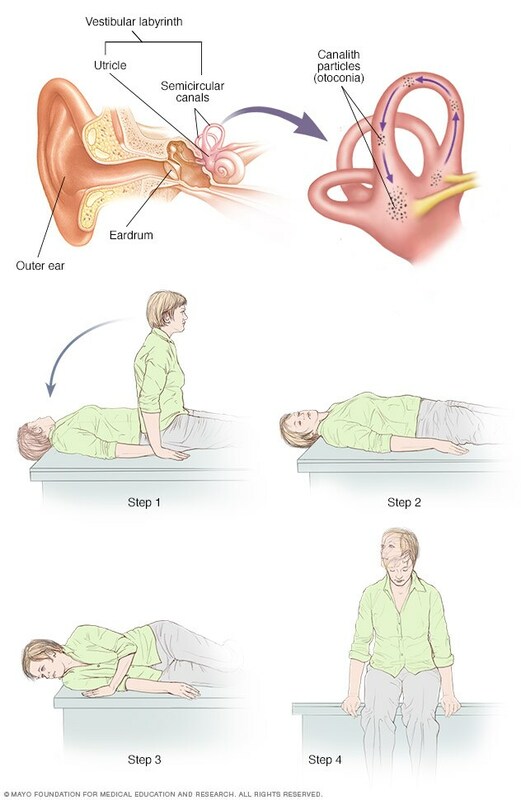 Repositioning maneuvers for benign paroxysmal positional vertigo. Current Treatment Options Neurology. 2014;16(8):307. Helminski, JO. Effectiveness of the canalith repositioning procedure in the treatment of benign paroxysmal positional vertigo. Physical Therapy. 2014;94(10):1373. Review. Canalith repositioning procedure (for BPPV). Vestibular Disorders Association. http://vestibular.org/understanding-vestibular-disorders/treatment/canalith-repositioning-procedure-bppv. Accessed April 21, 2015. Clinical practice guideline: Benign paroxysmal positional vertigo. American Academy of Otolaryngology — Head and Neck Surgery Foundation. https://www.entnet.org//content/practice-management?csModule=security/getfile&pageid=33697. Accessed June 4, 2018.